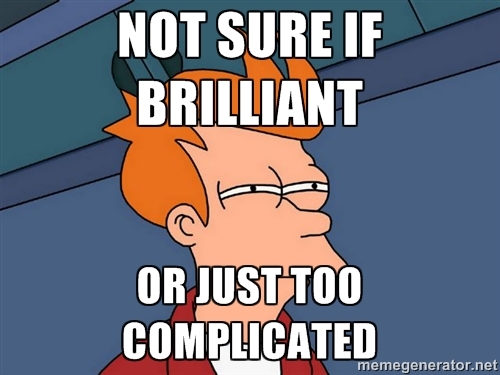 Pretentious Title: Writing Wednesday: WTF are Subplots and Do I Need One? To cite a personal example, when I was writing my Eli Monpress books I kept running into situations where I needed the reader to know how the top level politics of the world worked, but couldn’t do so believably with any of my main characters because that simply wasn't them. Their lives and stories were simply too far down the totem pole to be involved in the kind of scenes where I could show the reader how these top-of-the-world decisions were being made. To solve this problem, I created a separate subplot involving multiple politically powerful side characters (the big setting movers and shakers I'd only mentioned in previous books) and then showed that instead. This way, rather than doing a random POV cut to a bunch of people having a meeting because I needed the audience to hear what they were talking about, I could instead use the scene as an introduction to a new subplot involving a bunch of people who were already big setting names. Of course, once I did that, I then had to then figure out how to wrap this new subplot into my main story, but these kind of connections are surprisingly easy to make when you’ve got solid worldbuilding. One of my big big rules for everything in my books is that nothing happens for no reason. Everyone and everything is always working toward their own goals, and all of these actions and interactions have logical and realistic reactions. With that in mind, all I had to do to tie this new subplot to my main plot was figure out how these lofty important characters (and the big decisions they were making) were related to my main crew. Once I had that connection, the way forward became clear. All I needed was the link and a little creative thinking, and it was easy to figure out how to tie this new subplot (which I initially created purely to solve my POV problem) into my main story. Now this kind of thing might sound like one of those experienced writer moments, but trust me. If you've built a world that makes sense and filled it with realistic people with lives that realistically intersect, these kind of connections when you're in the text. It's just the way our brains work. We as a species live to make connections and find order in the chaos. You just have to make sure you've built a firm foundation. Once you've got that, you'll be amazed at how much else will fall into place. But that's a whole other worldbuilding post (which I'm probably going to write next)! For now, back to subplots. 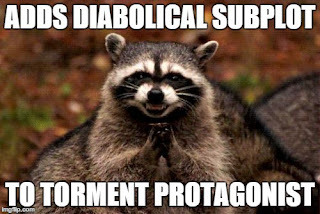 So that was an example of how subplots can solve writerly woes, but the truth is that a good subplot is so much more than a handy narrative problem solver. When done well, a good subplot plot will add depth, character drama, and a whole new viewpoint to the story that could not have achieved otherwise. You can use them to set in motion ticking timebombs your main characters know nothing about, heightening your reader's tension to the max as you force them to watch beloved characters blithely going about their plots completely ignorant of the anvil that's about to fall on their heads. A villain subplot can add humanity to a character who might otherwise be forced by the plot into coming across as two dimensional or shallow. Likewise, a romantic subplot can add poignancy and human weakness to a kickass hero who might otherwise be a slave to his/her own badass action plot. The possibilities for a good subplot are as wide and varied as your imagination, and they don't have to be complicated either. 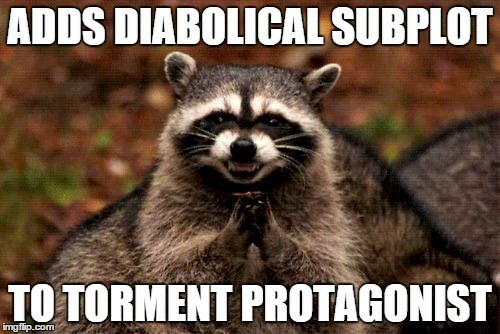 Subplots can be as simple as a few key interactions between the villain and his forbidden, doomed lover, or so big that you practically have two (or more) main plots running that eventually crash together. Both styles are excellent strategies that authors can use to great effect. The key, though, is to always remember that subplots are sub, as in below, the main plot. If you have a subplot that’s taking over your novel, you might want to stop and ask yourself if that’s not actually your main plot. This is not as obvious as it might sound. As we saw above, subplots can get very big, even to the point of practically being a main plot in and of themselves. Game of Thrones is an excellent example of a book where it is extremely hard to say which plot is the main plot. Now, clearly, this is working for GRRM, but he's the exception that proves the rule, because there are plenty of readers (myself included) who absolutely hate this kind of multi-thread story telling where you're forced to go back over the same events from multiple points of view. Now, obviously, you can do what you want with your book. But since you're here reading my blog, which (I hope) means you care about my advice, I would strongly suggest you pick one main plot and stick to it. Again, this is my opinion. I’m sure there are authors who’ll say that the whole idea of a main plot is just an outdated conceit. For my money, though, picking one plot as your main plot is the critical element to keeping your narrative focused, tense, and properly dramatic. It’s lovely to have a good, meaty subplot, but forcing readers to split their attention and interest too far is playing with fire. Readers instinctively want to know what a story is actually about. When we read a plot, we’re always looking for Who’s important? What events should I be focusing on? What details do I need to remember? Part of being a good writer is being aware of these questions and answering them in clever, creative ways, deftly focusing reader attention on the important details without resorting to heavy handed “this is important” exposition tricks. Or, as I like to call them, two-by-foreshadowing. To pull off these delicate slight-of-narrative-hand tricks, though, we authors have to know ourselves what is actually important in our stories, and that means knowing for sure which of our many plots is the main player. Again, this isn’t to say subplots can’t carry vital plot elements. They absolutely can, and are actually better when they do, but your main plot should always be the one that carries the main oomph of the story. It’s the common thread, the central axis that holds all the other subplots and character arcs together. If someone wrote a one paragraph book report about your novel, the main plot is the story they would tell. So if you're writing a story and you feel confused about where the plot is going, one of the best things you can do is stop and figure out which plot is your main plot and which are subplots. Who are the main actors in your climax? What is the central conflict that defines your turning points? What story is most important to you? That's the one that should be your main plot. If it's not, then you could have a subplot trying to take over, and that's going to cause a lot of narrative confusion for you and your readers. If you find this happening, step back and refocus on your main plot. Alternatively, if you feel that your story is too simple/short, or if you're having a really hard time working in parts of your worldbuilding or higher level magic/politics to your main story, you might want to try working in a subplot specifically designed to show these off. Creating a new view point character who lives in a vastly different part of your world than your primary cast (for example, if your MC is a nobleman, work in a plantation slave girl, or if your MC is a plantation slave girl, work in a noble man, and so forth). Now, of COURSE this new viewpoint character should be narratively important and relevant. We're not just adding story lines for the sake of story lines. Whatever subplot you choose should always hook back into the main story in some important way. Maybe the slave girl is the key to helping the nobleman escape to go on his adventure? Maybe they become unlikely friends? Whatever. You get the idea. The point here is subplots let you hop your reader to vastly different points in your narrative landscape that they would not otherwise get to see if you kept them stuck in the tunnel of your main plot. How exactly this will work depends on the needs and flexibility of your individual story, but so long as you weave all your subplots back into your main narrative before the ending (and, most importantly, make sure all those sub stories happened for a reason that makes sense/is important in the larger scale of the plot), you should be A-OK! If all of this sounds a bit daunting, don't fret. If you don't want to include a subplot or you can't think of how to link a new view point back into your main story, don't bother. Or, alternately, if you want to tell your story through dozens of subplots, that's fine, too. This is your book. So long as you do whatever it is you're doing well, everything else is just details. All that really matters here is that you stay consistent and keep your focus on the characters and story you've chosen to tell. Otherwise, if you drift off and let the subplots run wild, you're going to end up with a tangled mess. And while some authors definitely can make that messy plot thing work, it's not an easy path or one you should take on by accident. Messy or straight, though, you always have to know what story you're trying to tell, because if you don't know, how is your reader ever going to figure it out? I hope all of this has given you a new perspective on the insanely powerful writing tool that is the subplot. While they can be enough rope to hang yourself if done poorly, a well executed subplot will add depth and complexity to your book that simply can not be matched. Plus, they're a great way of showing showing events, character development, and information that just won’t fit into your main plotline without having to resort to silly tricks. It's a win/win all around! You just have to make sure you're keeping a firm hand on the rudder and don't let them run wild. But if you keep a hold on things and make sure to work all your subplots neatly back into your main one before the final climax, the sky's the limit on what they can do! So if you haven't thought much about your subplots before now, I really hope you'll give them another look. They are brilliant and wonderful and absolutely worth your effort. Oh, and they can eat you if you ignore them, so pay attention! The book you save might just be your own. And thus ends today's Writing Wednesday! I hope you enjoyed it! 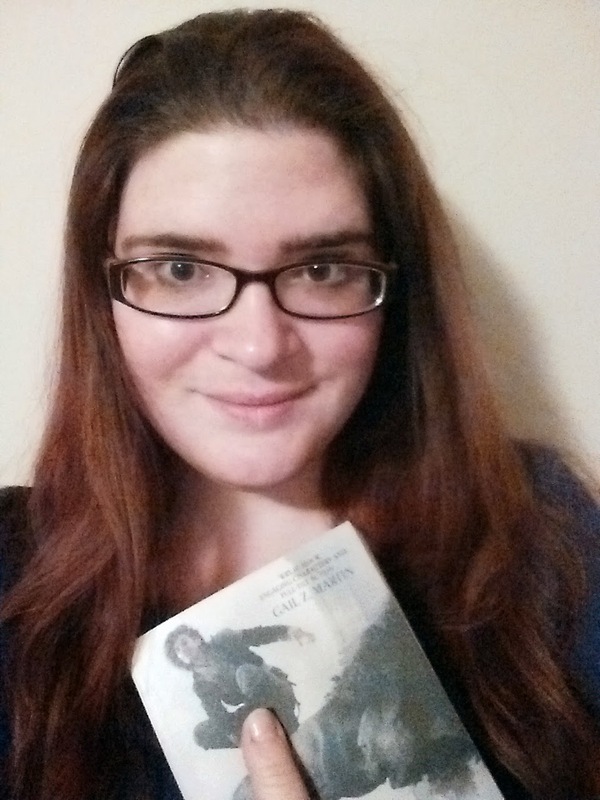 I do writing posts every week, so if you're not already, follow me on the Social Media of your choice (Twitter, Facebook, Tumblr, Google+) to get the new material as soon as it goes up plus lots of other awesome writerly stuff! As always, thank you as always for reading! If you're new to my blog, you can always click the Writing tag to see more posts like this one. 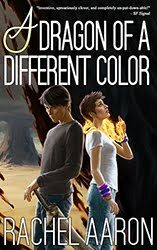 You can also visit www.rachelaaron.net for samples of all my novels and my bestselling non-fic writing book, 2k to 10k. Thanks again, and happy writing! This was a brilliant post! It gives me something to think about. I'd almost forgot about the sub-plot I intended to put into my current WIP! Thanks for the remainder. However. I am one of the people who learns best by 'mimicry' so to speak. I will read a book/scene/etc and intuitively notice what works - and the more I 'absorb' the better my own work becomes. (I read a lot of books on craft too, of course, but I get confused/frustrated with all the rules about plot points et cetera easily.) This made me think there might be something good to add into your post: It would be very very useful if you had elaborated a bit on the example of your own book. What exactly did you change? How did you weave it in? How did it all 'suddenly fit together'? Is it possible to do subplots when writing in first person? 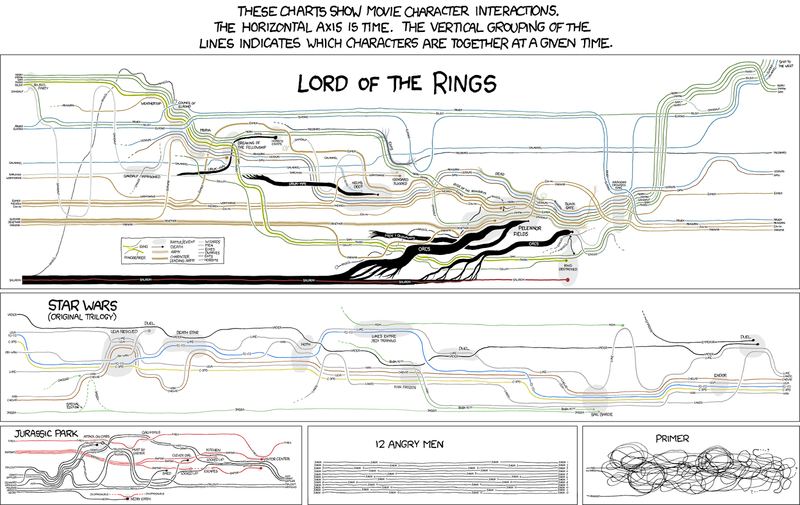 Or is everything just a very complex main plot? I'm writing a first person that swaps between two characters (like the Merlin Conspiracy by Jones), and by necessity have two parallel plots. Not sure where subplots fit in. Similarly, a work can deal with only a single plot even when told through multiple points of view. Each character has his or her own perspective on the plot. Multiple perspectives can add depth to the plot. Of course this doesn't preclude subplots. My work-in-progress is told through the third person but limited) point of view of view of a manager in a Silicon Valley startup. There are many subplots: finding and fixing a subtle bug, delivering custom software to an important customer with one day's notice, the general dysfunctionality of the company. If I do things right, these will only add flavor and context to the main plot, which involves a dead body found at the end of chapter 1. 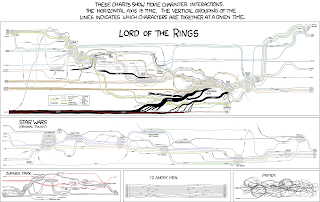 I love subplots.. my subplot map probably looks like the LOTR plot map, haha ... but actually, this was a really informative post. Sharing! Kessie, I write in the first person and I also write in series (mysteries with romantic elements). To keep the series going - even though each book stands alone - subplots run throughout it with at least one or two in each book. When you're world building you tie in family, friends, co-workers, locations, etc. All of those things can be fodder for meaningful subplots all along the way. Having a load of assignments breathing down your neck is one of the most agonizing feelings in the world. This website is the solution! sociology essay topics were always popular because it's the thing that never loses its actuality. Now you can choose one of it to create your essay.